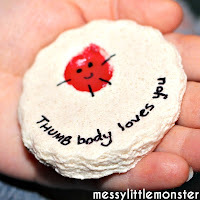 Salt dough crafts are so easy to make and I totally love our latest keepsake, a handprint bowl. 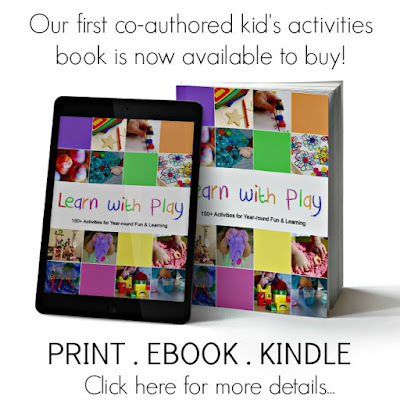 Follow our simple instructions and salt dough recipe to make your own salt dough bowl in the shape of your child's hand. 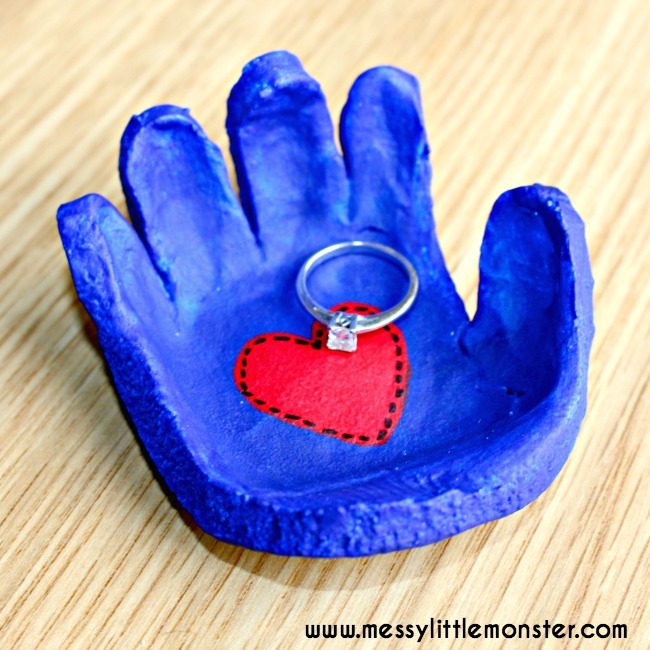 This is such a cute keepsake craft and the bowl is a perfect size for rings, cufflinks or keys. These dishes would make perfect homemade gifts for Mothers day, Fathers day or for Christmas. 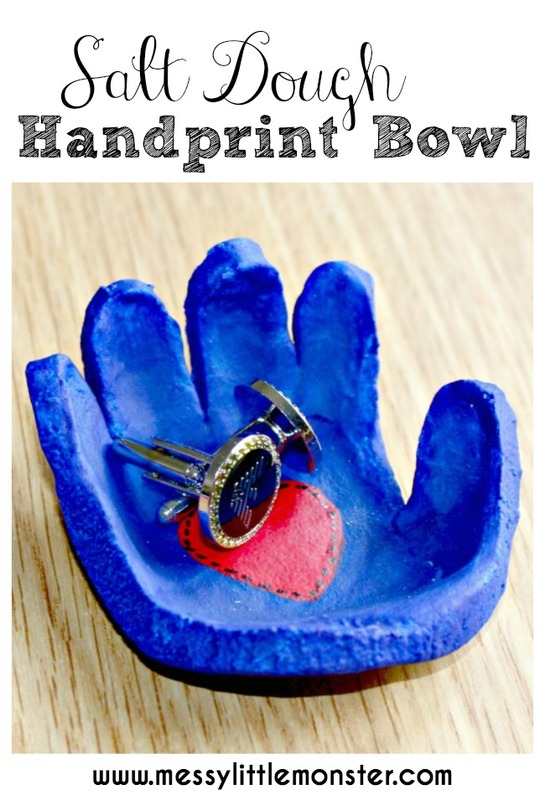 We love keepsake crafts and this adorable salt dough handprint bowl is no exception! 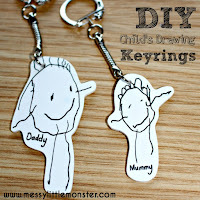 Take a look all our DIY keepsake ideas. Some of them really are adorable! 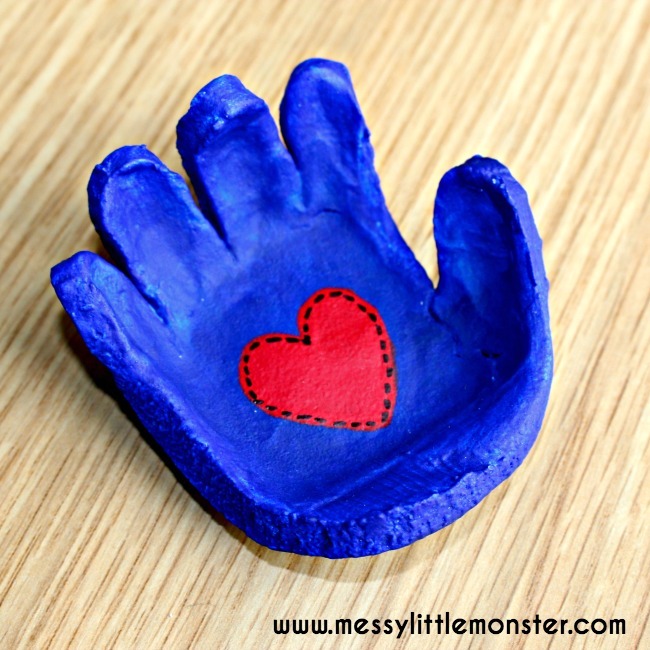 Made with tiny fingers, this handprint dish is a perfect keepsake to keep for years to come. The best bit is that is is useful too! 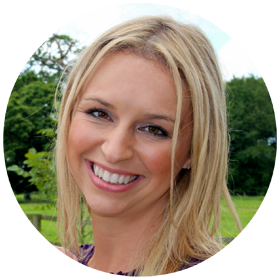 It can be used to keep tiny pieces of jewellery like rings in or it can just be put on display to remember how tiny your baby or toddlers hands really are. Any loved one would be delighted to receive a hand shaped salt dough dish. 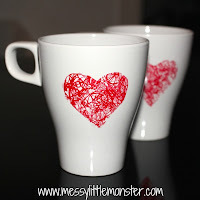 We have lots more DIY homemade gift ideas too. Do take a look. This hand shaped bowl is perfect for dads and grandads as well as moms and grandmothers as it is the perfect size to hold cuflinks or keys. We have also made an adorable clay footprint bowl which is a fun alternative if you want the keepsake bowl to be slightly larger and I love our butterfly shaped clay ring dish. We have also made clay handprint bowls using air dry clay. 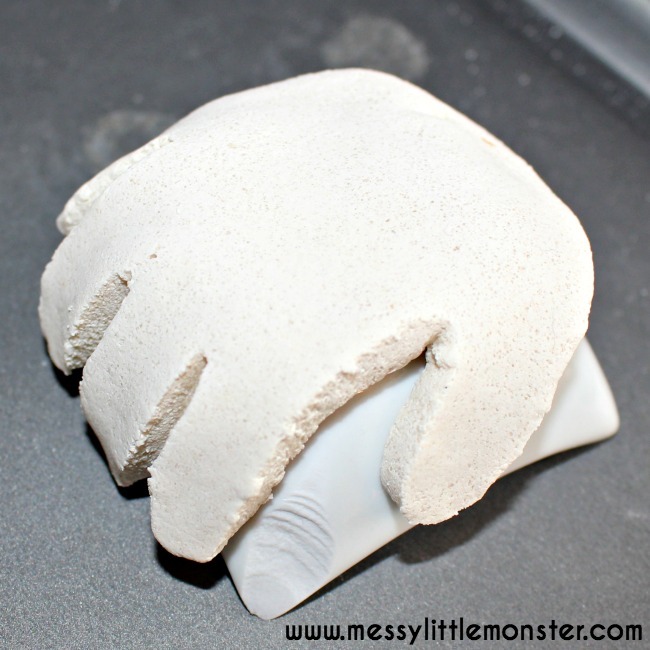 I love both of our keepsakes, but I would say air dry clay is a little easier to work with. Mix up some salt dough using our easy salt dough recipe. This recipe uses just flour, salt and water which means this bowl is a really cheap and easy craft to make. Flatten the salt dough using a rolling pin and press your child's hand onto it to create an imprint of their hand. The salt dough needs to be about 1cm thick. You will need to press your child's hand into the salt dough quite firmly and press down on each finger to make a good print. I would recommend rolling the salt dough out on baking paper as it will make it easier to transfer the salt dough later. 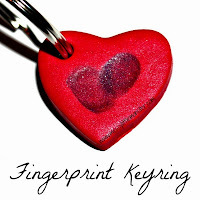 Use a sharp knife to carefully cut around the edge of the handprint. Put a small oven proof bowl on a baking tray and place the salt dough handprint on top of the bowl (see image below). We used a tiny bowl that is meant for dips. This will create the shape of your handprint bowl. Take your time to make sure you are happy with the shape of the salt dough hand. Bake the handprint in the oven at a low temperature (about 100 degrees celsius) for a few hours. When you remove it from the oven check that the salt dough is completely hard on both sides, if it isn't just put it back in the oven for a little longer. Once the handprint bowl has cooled down it is ready for decorating. I painted our bowl in acrylic paint. 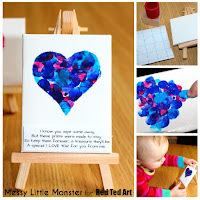 I painted it blue and then once the blue paint had dried I painted a red heart on top. Then I used a black sharpie pen to add detail to the heart. 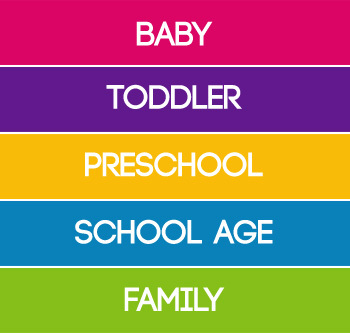 Older toddlers and preschoolers could paint their own dishes to make them even more individual. It is important that once your salt dough creation is finished you add a coat of varnish or use a sealer so that your keepsake will last forever. If you don't use a sealer the salt dough may soak in some moisture and become soft. We use mod modge all in one glue and sealer (linked above). Hand shaped bowls are the perfect size to put rings, cufflinks or keys inside. 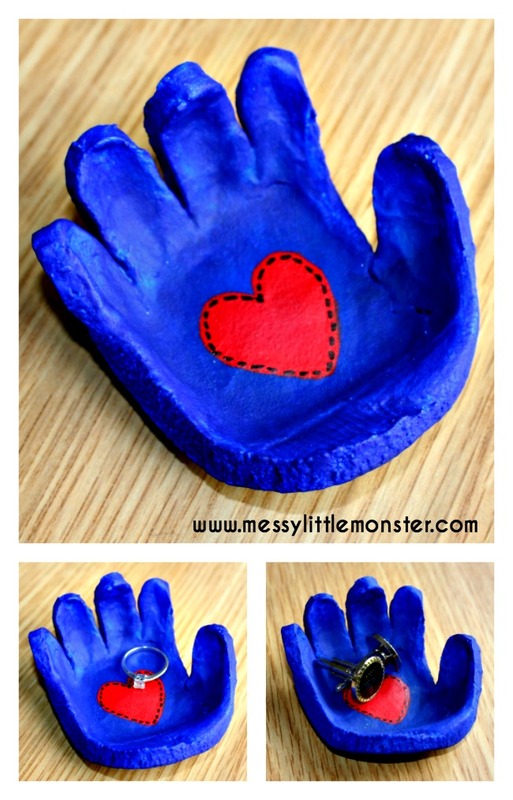 These salt dough handprint bowl keepsakes would make perfect kid made gifts for toddlers or preschoolers to make for Mothers Day, Fathers day, Valentines Day or Christmas. See lots more homemade gift ideas here. If you have enjoyed making this salt dough keepsake you must take a look at our other salt dough craft ideas. 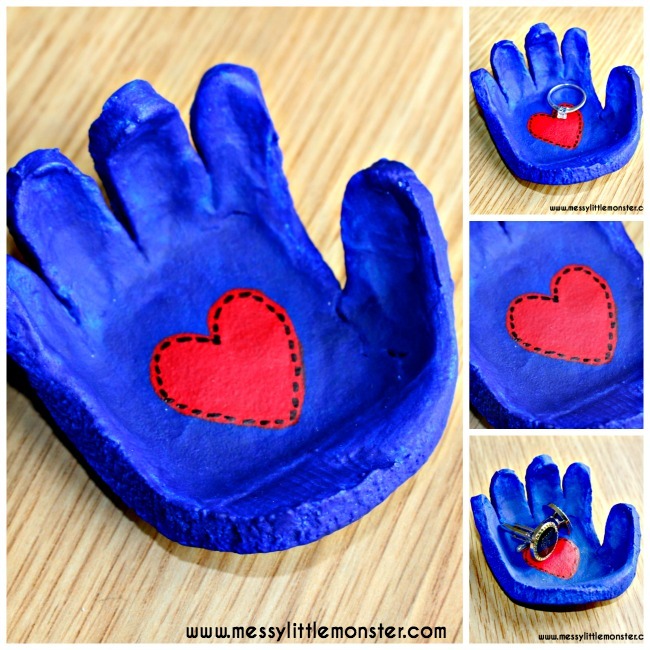 We totally love using salt dough to make keepsakes. One of my favourite crafts is our salt dough santa handprint ornaments that I made when the children were a baby and a toddler, they make such a cute set and I love getting them out every Christmas. I also love our salt dough fingerprint christmas tree ornament and our salt dough photo frame ornament. 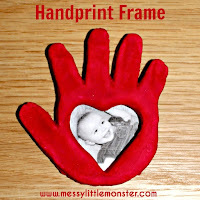 If you are looking for salt dough craft ideas that you can use as gifts or keepsakes at anytime in the year, maybe as a diy birthday gift or for Mother's day or Father's day you might like to try making a salt dough handprint frame or some salt dough magnets. The salt dough magnets are a great craft to do with a larger group of children, they would be perfect to make in the clasroom. Can you spray paint these ? we used acrylic paint but i'm sure an acrylic spray paint would work just as well. It might give a more even finish too.